5 Must-Have Tools To Transform Your Track Work From Terror To Triumph, Updated! There are an astonishing 10,072 miles of track in the UK. I’m sure glad I don’t have to lay that much on my layout, especially as track work is the area of model railway construction I dislike the most. 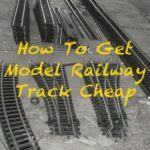 I’m not talking about ballasting— that’s relatively easy once you understand the technique and have a ballast spreader — or track planning which I enjoy (I can spend ages sketching new track layouts and then working them out in detail in an application like AnyRail). And it’s not tunnels, embankments or cuttings that many people struggle with. I really enjoy constructing those! No, the aspect I struggle with is laying track down in the right place while maintaining good rail joints and electrical connections. Maybe it’s just me but positioning track so rail joiners line up, and align with the wiring holes and the track plan markings all while not getting covered in glue is just one frustration after another. And then just when I think it’s all done I find a wire has worked loose because it wasn’t soldered correctly (see this article if you have that problem) and I need to start over. Or worse, a point has somehow got damaged and needs replacing. And that point will, of course, be in the most awkward place. Typical! This stuff does my head in. Or it used to until I acquired the right tools. Having the right tools for a job makes it so much easier. Who would have guessed?!? And they’re not just screwdrivers and the like. These are uncommon tools that it’s taken years — and lots of broken track — to discover. Some have been recommended, others I’ve found after a track troll has visited and I set out to find a better way of slaying him. Here then are the 5 tools I’ve acquired over the years that will transform your track work from terror to triumph. For reasons I won’t dwell on here, I recently needed to run some wire under a strip of track. In the past, this would likely have resulted in either damaging the track as I drilled the hole because the drill touched the rails or I’d have pulled up the track and started again. Either way, really frustrating. With my trusty Archimedes drill, however, I was able to make the perfect hole, with pinpoint accuracy, without risk. I found my original one of these at a boot fair long ago and haven’t looked back since. The small finger-operated shaft gives me the precise control to allow holes between sleepers and what would have otherwise been nerve-racking difficult job becomes a simple five-minute exercise. It can also accommodate incredibly thin drills and so can also be used to create holes in the sleepers themselves (even at N gauge) so inserting track pins isn’t such a risky job. To be honest I got these for model building construction but have found they’re incredibly useful for checking the distance between rails after heavy track work. 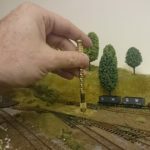 A few misplaced hammer blows while track pinning can easily knock track out by a tiny but significant few millimeters and which will derail a loco or wagon. With these digital calipers, I can quickly check the rails are still correctly spaced as I do the work. What I like about the digital variant is that the display can be seen easily as they’re moved along the track. With the old school variety, which I have and use for some jobs you have to read off the rule so for track work, these win every time. And of the brands available, I prefer the Mitutoyo Absolute Digimatic Caliper from Amazon, or here for visitors in the US, for the following reasons. Very accurate (a problem with some of the cheaper alternatives). Although as a budget alternative, this is my second choice and which I use when I occasionally misplace the Mitutoyo set. I work with both fixed and flexi-track and in various gauges but irrespective of the track you work with there always comes a time when rails need cutting. Slip in a cutting disk, don the safety glasses and the rails are cut to size in seconds or fit a sanding drum disc and a few mill overshoot that would otherwise require relaying can be quickly shaved off. I do have Xuron cutters (available in the Model Railway Engineer shop) and while they do have their uses, for me the Dremel wins for speed when only a tiny bit of rail needs removing or a section of track needs cutting out. 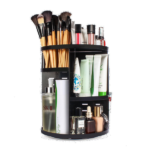 And not only is it a great general purpose too around layouts it has a million and one uses elsewhere around the house. See my review of the Dremel 3000. 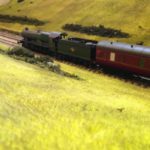 A soldering iron is a must-have for all manner of model railway activities but for track work what’s needed are fine tips — the ‘bit’ is the bit that gets hot. The 25W is more than enough for most jobs but what really makes it ideal and ideal for track work is the ability to change tips. 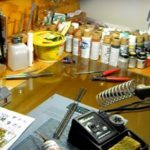 Compared to the sledgehammer sized tips of many standard soldering irons, the tips available, .5mill and up, are much easier to work with on even N gauge rails. The Antex XS25 isn’t the cheapest but it is very well made, conveying the heat from the heating element to the tip, is comfortable to hold and has that all-important exchangeable tip. It’s not surprising I and so many other modellers swear by it. I’ve left this one to last as it’s not really a tool but since getting these my work around my track has become a LOT easier and less problematic. I used to work with track and from what I could see believed everything was fine. It was only later that it became apparent that all was not what it seemed. It’s only when looking through magnifying glasses that I realised how much I was missing. I could suddenly see gaps between rails at joints, bad wiring connections and even blobs of glue on rails the will play havoc with the rolling stock wheels. But it’s taken me a while to find the magnifiers that work best. Initially, I used a jewellers loop and even a Sherlock Holmes style magnifying glass but these require one hand to hold them and when you’re trying to hold track and work on it at the same time this doesn’t work. I also tried Helping Hands style tools where a magnifying glass is mounted to a base but these needed surface space on the layout on which to position and steady them. This just wasn’t practical for much of the layout. Many people use well known black plastic head magnifier seen in hobby stores but these were uncomfortable and gave me headaches so I went in search of an alternative. 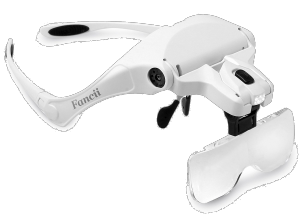 Read my review here but in summary, not only does it leave both hands free without requiring space on the layout but it has multiple levels of magnification which makes them ideal for different types of work. It also has a built-in light and is comfortable to wear, no more headaches! While not strictly a tool, and hence why I’ve not titled this post a list of the top six track tools, an engineers block is a great aid for track laying. I first came across these when doing a mechanical engineering course about the same time as I was creating my nascent layouts as a teenager, many years ago. In workshops, they’re used for milling and grinding and while I didn’t stick with mechanical engineering as a career I did remember these when looking for something to hold the track down while the glue sets. I now own my own set for this reason and they’re perfect for the task. 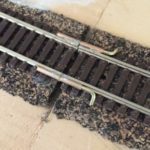 Their weight is just right to hold the track in place without damaging the rails and the narrow width makes them ideal to sit on OO/HO gauge track without occupying too much space either side, as is the problem with the common make and do “bottles of water” solution. They can be oily and greasy however so always place a sheet of paper between them and the rails. They’re available via eBay here. So there you have it, my five favourite tools for track work. None are essential but they’ve transformed my track work and make an often annoying job easier and faster. In fact, sometimes I now almost enjoy it! 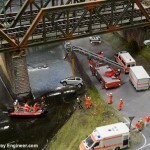 I’m always on the lookout for other tools and techniques that help so if you have a trusty tool that makes your life easier please share it in a comment below and I’ll add it to my model railway online shop. I like the idea of an App such as AnyRail for track design purposes. However, as I use an Apple iMac it would be useful to know if you or others have heard of or can recommend an equivalent App for use with the iMac. Thanks for your prompt reply. I’ll try thiwhen I get home in a few days. Currently catching up on your site while away from home. No problem Pete 🙂 Thanks Paul, comments like yours make it all worthwhile. Do you have any other tools that you’ve found useful? Alan/Andy. All these comments are invaluable–and very much appreciated. I do admire your persistence, saying you had to start anew with your track etc. Hi Allan, I recently tackled this very problem and wrote about an accessory I’ve found. Hi, Andy. I’m 85, so my hands shake a bit! I find that holding a long pair of tweezers grasping the object steadies, leaving the other hand free.